Frustrated with Spending Way too Much Time in the Kitchen? We made the pork and fennel burgers last week and they were incredibly flavorful and tasty, perhaps a good one for your app — looking forward to your app! The first time I used your Soupstones Meal Plan it was because our kids had both gone off to university and I could not stop myself from buying the amount of food needed for two kids and various friends. Sticking to the meal plan helped me realize how much food to buy for just two again! This time around, it’s helping me to keep meals simple during the week. I love to cook, but I kept deciding to make meals during the week that took too much time. The meals on your plan are fresh, delicious and fast, and the shopping list keeps me on track. So I setup some time to talk to Marjorie in more detail about her experience with Soupstones Meal Plans. JULES: What hesitations did you have about signing up for Soupstones Meal Plans? MARJORIE: What initially stopped me from doing it was actually money. At first I hesitated about spending money on something that I could do myself. And I could do all this myself but I wasn’t. I’m a really good at food. I’m good at cooking. I’m really interested in it, so I should be able to do it. But with the meal plans it’s all here. You’ve done it all. My husband and I work together, and if we’re coming home and it’s late you think ‘oh lets just pick something up’… It’s so easy to use the meal plans. It keeps us from eating out when sometimes we would. Then you realize if it keeps you from going out even once then that’s like $12. If you can afford to go out to dinner then you can afford to do this. Because it’s going to save you at least that amount of money. Then there were the monthly payments. And that makes you stop but I realized pretty quickly the value. At first I really doubted that we would like it. Or that it would taste good because of the limited amount of ingredients. I’m used to putting garlic and onion into everything so it felt funny not to do that. But I followed it. And I was surprised that everything tasted good. The other thing I hesitated about was seasonality. We live in an agricultural area we have very specific local things available at certain times. So not being able to shop specifically towards sales when they came up. Like ’spinach is on sale’ or ‘kale is on sale’ or whatever. Then I also have a garden. So having the seasonal meal plans has been really helpful. Very much so. And I realized that I can really modify the meal plans easily for what is hyper locally available. JULES: What did you find as a result of using the meal plans? MARJORIE: I really noticed the time saving aspect. Big time. I like cooking and the meal plan stops me from going ‘oh that sounds really good’ when it’s the middle of the week and I’m working and I’m trying to work on my side hustle stuff. So I don’t want to spend a lot of time cooking like I used to when the kids were here and I was in the kitchen anyhow when they were doing their homework. Now I just want to get ‘in and out’. The plan keeps me honest. It keeps me focused. And I really trust you a lot. Something important that sets you aside from a lot of people is your background as a food scientist. That brings a lot to the table. When you say in your storage options that you can keep something this long. And to trust smelling and tasting things yourself. That made me hang onto things longer and avoid getting rid of food before I needed. I also found I was able to cook on my own very easily rather than following recipes. Because I used to be a big recipe follower. Now I’m able to open up the fridge on the fly and go ‘I’ve got this, and this and this’ and I’m going to trust that it will taste good. So that was a big result that was different from how I cooked before. I can trust myself to do my own thing. Every so often my husband cooks. I forward the meal plan to him so he can see what’s going to be happening for the week. Sometimes he will cook one of them. Now he’s buying into it. Initially, when I first did this he had a lot of hesitations about liking it. He was worried we were going to change completely how we eat. But it really didn’t change a lot how we eat. It just changed the amount of time I put into the meals. So it was great. He liked it. JULES: Which specific feature do you like best? MARJORIE: It’s hard to choose one thing. Saving time. That’s what motivated me to pay for it again is the time saving. However, I wouldn’t have done it if it wasn’t really healthy to begin with. So it was really really important to tick both boxes. Then I got diagnosed with pre-diabetes even though I’m eating so well. And when you also got diagnosed I knew you were very conscious with your recipes for the meal plans for that. Very helpful. We had done the Whole 30 and this just fits right into it. I love to have a lot of vegetables. So I usually supplement the meal plans with a side. I often do some extra roast veg or a salad. Just something thats really easy so it’s not an issue. The shopping list gets me in and out of the grocery store really fast. Because I’m really slow, I don’t know what happens when I go into the grocery store. So I just shop from Jules Clancy’s list. And I go in and just get whats on the list. And that’s it. So the shopping list is a huge deal for me and it for sure saves me money. Then even though I do like thinking about food and planning, it’s nice during the week not to have to. It’s really nice to have it all planned out for me. So I don’t have to make that decision when I’m tired. JULES: What makes Soupstones Meal Plans unique? MARJORIE: The limited amount of ingredients for sure. And what you’ve done with the variations. So you’ve got your meal and then you go ‘more veg’, ‘more carb’, ‘no dairy’. You’ve got all these options. It’s all there. It’s just really, crazily well thought out. I can’t imagine how much time it’s taken you over the years to get to this point but it is organised. The flexibility, making it easy to adjust. It’s very unique. The fact that you’re a food scientist and you know what you’re talking about. That is also unique. Because people don’t usually come from that background and I think that’s a big deal. JULES: Would you recommend the meal plans? MARJORIE: I would and I have. Because you really learn how to cook healthily without sacrificing the taste and the satisfaction. Sometimes I think is that going to be enough of a meal? And it is enough. Because we add the vegetables, I’ll often divide it into 3 so my husband and I will have dinner and then he has lunch the next day. And I tell people you save time and money by shopping for just what you need. I have friends and relatives who use Blue Apron and this is way faster than that. And Blue Apron is expensive. And the packaging all those ice packs and all the stuff you have to throw away. I feel bad about that so I think ‘just do Soupstones Meal Plans’ . Seriously, it’s faster, it’s way cheaper and better for the environment. Tired of spending too much time in the kitchen? 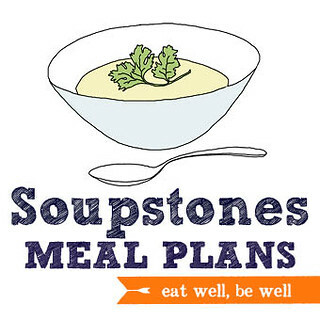 If you want to simplify your planning and cooking, then check out Soupstones Meal Plans. It’s a weekly meal planning service where someone else comes up with simple ideas for what to have for dinner. Thank you and Chocolate and Zucchini. I was doing the meal plans but quick because it wasn’t accomadating enough for vegans many recipes had vegan options but not all. But I’m not writing this comment to complain – the meal plans didn’t work for me personally but for regular folks I think they would be great. I have a suggestion. A vegan cookbook I know you give vegan options for most of your recipes and I love that. But for someone like me who hates to cook. That can be hard over time. If you put together a vegan cookbook I wouldn’t need new recipes just the veganized variations. Especially the quick ones (seethe aforementioned hate to cook). I’m not doing anything that takes more than 10 minutes. Although I will do some meal prep.